If you are looking for an easy way to entertain the kids, just add water! Most children love getting wet, but splashing about is just the beginning. Many activities have both wet and dry versions, and lots of sports and outdoor activities involve water. If you’re concerned about your children getting enough exercise, water activities are perfect, as most of them involve moving against the resistance of the water. 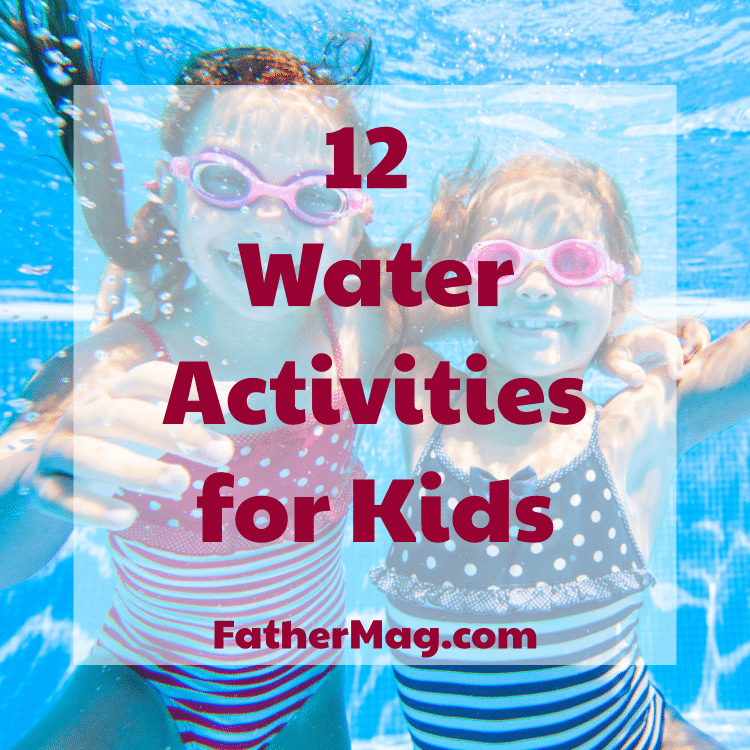 Try these activities, and you’re likely to discover that many of your best times with your kids include water! A lifetime of enjoying water begins in the tub, which is where children first get accustomed to the properties of water. Many babies enjoy water from the first, but others need a little time and some encouragement before they are comfortable splashing and getting water in their faces. Putting your child in the bath with a friend or sibling is one way to make it less intimidating. Another way is to buy some cool bathtub toys. Toy boats are a natural for bathtub play. Wind-up toys that “swim” through the water are fascinating to most kids. Older children will enjoy a fishing set, with a miniature pole and plastic fish for catching. You don’t have to buy special bath toys, however, Most plastic toys can be played with in the tub. Avoid those that will hold water, however, as they are sure to grow mold on the inside. Kitchen goods like measuring cups, funnels and pitchers are also suitable for bathtub play. Just pop them in the dishwasher when bath time is over. If you’d like to encourage your little artist, you can buy bathtub crayons, finger paint and markers, all designed for use on the bathtub walls or surrounding tile areas. Easy clean-up is the draw of these products, but be sure to test them before you give them to the kids. Older tubs or grout may stain, especially with pink and red tints. The best summertime games involve water balloons. Filling them can take a while, so get the whole family to help. Then gather out on the lawn and try these games. Balloon Toss. This game involves two players tossing a water balloon back and forth. After a pair of successful catches, both players move a half a step back and toss again. The player who misses first usually gets splashed when the balloon hits the ground. If the balloon survives, the game can continue. Slippery Soapy Catch. Participants stand in a circle. Everyone dips their hands in a mild solution of water and dish soap so that their hands are slippery. The balloon is then tossed around the circle. Players who fail to catch the balloon must leave the circle. The winner is the last one in the circle. Basket Catch. Players pair up. One player has a stash of water balloons, and one has a small plastic basket. The first player stands behind a line and tosses the balloons into the basket. The player with the basket can try to help catch the balloons. The winner is the team that gets the most unpopped balloons into the basket. Wet Musical Chairs. Actually, there are no chairs needed for this game, but the concept is the same. Put water balloons on the ground in a circular pattern, one fewer than the number of players. When the music stops, everyone tries to find a balloon and pop it by sitting on it. The person who ends up without a balloon to pop is eliminated from the game. Pinata Pop. Hang a water balloon from a clothesline or another line that you have rigged up. Let the kids try to break it as they would a pinata. You can use a regular balloon instead of a water balloon, as it will be harder to break. Children can play for hours with a simple water hose or sprinkler, but there are also devices designed just for backyard water fun. Here are some of the most common types. Fancy Sprinklers. Whimsical designs and multiple sprays of water make these more appealing than lawn sprinklers. Sliding Devices. Some of these are simply pieces of plastic that are sprayed with water to make them slippery. Some are inflatable for more comfortable sliding. Caution: Adults and heavier children have suffered injury when using these toys. Kiddie Pools. Backyard kiddie pools come in several models, including rigid plastic, inflatables and semi-rigid frames with vinyl liners. Some features easy set-up and others are easier to store. Each type has at least one advantage and one disadvantage. Your child will have fun in any of them. Water Tables and Water Walls. These are designed for children to play with rather than in. They involve pouring and catching water in a variety of containers. Every child should learn to swim. Knowing how to swim is not only a safety measure and a survival skill but also is needed for any number of other water activities. A more complicated issue is when children should learn to swim. Authorities do not agree on a definitive answer, but many parents trust the recommendations of The American Academy of Pediatrics (AAP), which are as follows. All children over 4 should be able to swim, and those aged 1 to 3 may benefit from swimming lessons, depending upon other factors, such as emotional maturity and physical abilities. The AAP does not recommend survival swimming lessons for children under one year of age because their effectiveness has not been proven. The ability to swim is just one of the layers of protection that careful parents use to keep their children safe around water. The first and possibly most important layer is adult supervision. This means that an adult should always be within arm’s length of babies, toddlers, and weak swimmers. Older, stronger swimmers should always be watched by adults. Other examples of layers of protection include barriers around pools and pool alarms. In addition, those supervising children should be trained in how to handle emergencies. Swimming is a great exercise for children. Older children may be interested in competitive aquatic sports. These include swimming, diving, water polo, and synchronized swimming. Competitive swimming is a good activity for many special needs children. Read also: 14 Summer Activities for Kids. If you have a pool, your kids are likely to have lots of friends around, which means you’ll always have participants for these swimming pool games. If you use municipal pools or pools at motels and resorts, you’ll probably still be able to find plenty of players. These games go beyond the classic Marco Polo and will have your kids laughing non-stop! What Time Is It, Mr. Fox? This game is adapted from a game that is often played in school gyms and on playgrounds. The player who is Mr. Fox stands at one end of the pool. The other participants stand at the other end, or at the rope if your pool has a deep end. A player calls out, “What time is it, Mr. Fox?” and Mr. Fox answers with a number, which allows the players to take that many steps forward. At some point Mr. Fox responds to the question by saying, “Lunchtime!” and tries to tag a kid. The first kid tagged is the new Mr. Fox. You can also line kids up on the sides of the pool to play this game, a strategy which allows you to put the shorter kids in the more shallow water. Pool Races. Of course, it’s fun to see who can swim across the pool the fastest, but you can also add wacky variations. See who can get to the other side of the pool fastest while sitting on a floatie or pool noodle. You can also toss in some rubber duckies and see who can get their duck to the other side of the pool first without touching it. Ping Pong Grab. Buy a big bag of ping pong balls and dump them in the pool. Give each player a beach pail. The winner is the person who can scoop up the most balls and put them in their pail. Beach Ball Air Ball. See how long you can keep a beach ball in the air. There’s no real scoring or competition, but kids still really get into this game. Quiz Me. Kids line up on the diving board or side of the pool. The Quizmaster asks them easy questions as they jump into the pool. They have to answer the question before they hit the water. If they can’t, they are eliminated. Kids are also great at improvising their own games. For safety’s sake, you should have them run any new games past you, so you can be sure that they aren’t risky in any way. Toddlers and preschoolers will have a blast at the beach without much involvement on your part. Your function is to keep them safe from sun exposure and other beach hazards. With a few beach pails and shovels, they will probably occupy themselves for hours, even if they never get into the water. Bubbles are also great fun at the beach, as with a good breeze they will blow themselves! Older kids may get into shell collecting and sand castle building. If the wind isn’t too strong, the beach is good for Frisbee, volleyball, badminton and other outdoor games. A beach that is not too crowded is perfect for flying a kite. Sand Art. Draw pictures in the sand and enhance with found objects such as sticks, shells, and feathers. Nature Study. See how many different kinds of life you can find on the beach, in tide pools, and in shallow water. Take pictures of them, sketch them or use guidebooks to identify them. Collections. Start a collection of shells. Look for shark teeth, sand dollars, and sea urchins, too. Shell Crafts. Gather shells to use in crafts once you return home. Use them to decorate mirrors, picture frames, planters, and wind chimes. The kids can also use them to make cool jewelry. Limbo. Crank up some tunes and show the children how to limbo. You can use a piece of bamboo or a pool noodle as the limbo pole. The classic song is “Limbo Rock” by Chubby Checker, but any lively reggae or beachy tune will work. Most kids consider water parks the ultimate in fun. Parents may not be quite as enthusiastic. Still, all members of a family can have a good time with a bit of planning. The Hours. Crowds will be smaller when the park first opens up, but the water may be too cool for comfort. It will be warmer later in the day. Some parents prefer to go to water parks in the evening when sunburn isn’t as much of a concern. Suggested Ages. Good water parks have some attractions for all ages, but some may be designed more for young children and others more for tweens and teens. Clothing and Equipment. Many water parks have specific rules about the types of swimwear that can be worn and the accessories that can be brought in. These rules are usually either to protect the equipment or for the safety of those participating. Some clothing requirements have to do with modesty. Skimpy swimsuits may not stay in place on some of the rides. Lockers. Find out what provisions the park has for keeping your phone, wallet, keys and similar items safe. Of course, you shouldn’t bring any valuables that aren’t strictly necessary. Don’t rely on locking your valuables in the car, as thieves have been known to target water park parking lots. Food and Drink. Find out if the park allows visitors to bring in coolers or other food containers. If the answer is no, find out if there is a picnic area outside the park. Water park food tends to be overpriced and not very healthy. Prices. Tickets may be cheaper if bought online. Also, some parks offer bargain days or discounts after a certain time. Although it has been practiced in places like Hawaii for centuries, the modern sport of stand up paddle boarding or SUP is a relatively new phenomenon. It’s a good workout, a fine way to enjoy nature and challenging activity to do with older kids. Some SUP enthusiasts take their toddlers out on their own boards, but by around age 5 or 6, many children can be taught to maneuver their own boards. A ratio of one adult for each child is best for beginning paddle boarders. Boards for children should be appropriately sized, and of course, kids should always wear personal flotation devices (PFDs). Before taking children out for the first time, place the board in an area of soft grass or sand and let the kids get the feel of standing on the board. Look for a small, calm body of water for first outings for newbies. Also look for an area with little or no boat traffic, and always check the forecast before you go. Read also: 13 Food Activities for Kids. Kids who are athletic and adventurous can have a blast at the beach with the introduction of a board. Beach boards include skim boards, boogie or body boards, and surfboards. If your child is interested in boarding, lessons would be a good idea, unless you are an expert with a knack for instruction. It’s also extremely important to know the area where your child will be boarding and be sure that it is suitable for your child’s skill level. Skim Boards. There are two kinds of skimming, and they require different types of boards. Sand skimming is done at the edge of the water, right after a wave leaves a thin layer of water on top of the sand. In wave skimming, the skim-boarder rides the board into a breaking wave and then rides the wave back to shore. Both sports require practice and a willingness to take a few falls. Body Boarding. This sport is also known as “boogie boarding,” but because that term has been trademarked, body boarding is the preferred term. Participants in this sport ride waves on their bellies on a short foam board. Surfboarding. The classic form of surfing is done standing up on a board that is longer than a skim board or a boogie board. This type of boarding can be dangerous. Most injuries come from collisions with the board. A river float can be a leisurely drift on a slow current or a faster-paced float featuring some rapid water. Unless you are an experienced river runner, you shouldn’t take your children through rapids. Sign up for a guided trip with a reputable company instead. Taking a rubber raft or tubes down a slower moving river should be enjoyable and not too risky. Of course, everyone should be wearing sunscreen and their PFDs. If you’re going on a trip involving rapids, everyone will need helmets. Water shoes are a must as most river bottoms are rocky. If you can afford it, a multi-day guided river expedition can be the trip of a lifetime. The rafting companies take care of most of your needs, and you can spend a relaxing evening looking at the stars or enjoying a campfire. This type of trip is ideal for adults and older children. Fishing with children can be great fun, but if your children are beginners, be prepared to spend a lot of time helping them and not much time with your own hook in the water. Also be prepared for them to get tired quickly, especially if you are not catching much. Since the fish don’t always bite, you can try to catch some of the other edible species that live in the water. Depending upon your location, you may be able to catch crabs or lobsters, pick up scallops or oysters, or dig for clams. The harvesting of these species is typically very rigidly controlled, so check with your local department of fish and wildlife to be sure you are in compliance with all regulations. The term “boat” can be applied to a wide variety of vessels, and some of them are sure to appeal to you and your kids. You don’t have to buy a boat, either. They can be rented from numerous facilities. “Try before you buy” is a good motto for most who think they would like a particular type of boat but who don’t have experience with it. Handling a boat requires a skill set that is unique to each type of boat. If you grew up sailing or motorboating, you may have all the expertise you need. If not, you should go out with an experienced boater or arrange for lessons. A boating safety course is recommended for both you and your kids if you plan to spend much time in any type of boat. Paddle Boat. This type of boat is powered by pedals, which turn a paddle located under the boat. For this reason, it may also be called a pedal boat. A paddle/pedal boat is inexpensive, safe and fun for kids. It’s also slow and not very maneuverable, making it unsuitable for bodies of water with strong currents or for use in windy weather conditions. Some enthusiasts get around some of these difficulties by attaching a trolling motor to their paddle boats. Kayak. The most versatile type of boat around, kayaks come in types to suit many different needs. The simplest is sit-on kayaks, which tend to be stable and easy to launch. They are also lightweight and easy to paddle. The next step up is a traditional sit-in kayak. Ocean kayaking and whitewater kayaking require special designs. If you have limited space for storage and carrying, you can get folding or inflatable kayaks. Canoes. These venerable and versatile vessels have the reputation of being easy to tip, and they can be unstable. Different designs have different levels of stability, however, and most of the time capsizing is a result of operator error. An upset isn’t too serious if it occurs in warm water, but those who capsize in cold water can be at real risk of hypothermia. If your children are young or inexperienced paddlers, don’t take them far from your starting point, and don’t take them out in cold water. Sailboats. Boats that operate on wind power range from tiny one-person boats to massive yachts. Learning to sail is a highly educational activity that also involves hard work, discipline and, for larger boats, cooperation among crew members. Motorboats. Power boats are the usual choice for fishing and for water sports. Many children take to water sports that can be enjoyed behind a motorboat, such as tubing and wakeboarding. Regardless of which type of boat you choose, you should impress upon your children the importance of safety. They should be also be taught to help clean and maintain the vessel, as that is an important component of boating. Read also: 12 Sand Activities for Kids. Have Fun But Keep It Safe! Water play is a favorite of most kids and many parents, but it does present challenges. Vigilance is the number one way to ensure the safety of children in and around water. If you are having a good time, it is easy to let your guard down. If you are enjoying the water with friends, you can take turns watching the children, but never entrust your children to someone who is not responsible or who have been drinking. Older children should be educated about drowning prevention. They should know how to enter water safely and what to do if they get into difficulty in the water. Other safety issues are less extreme but still important. For example, you don’t want your kids to get a sunburn, as it has been tied to skin cancer later in life. Educate yourself about how to protect children from sun exposure. One thing you should know is that sunscreens with a super-high SPF aren’t much better at protecting skin that ones with an SPF of 15. Do use a product that protects against both UVA and UVB rays. Rash guard shirts are a lifesaver for many parents. They cover much of a child’s most vulnerable skin and also protect against chafing. Hats help a lot, too. Children may be more likely to wear their hats if they have been allowed to pick them out. Sunglasses are recommended for kids because exposure to UV rays has been tied to the development of cataracts later in life. Parents must also be careful to keep children hydrated. When they are in the water, they may not be aware that they are sweating. Also, they may be so involved in a play that they don’t realize that they are thirsty. This can be true of both younger and older children. Make it a point to give younger children a water break about every 20 minutes. Older children can go a little longer because they typically drink more at one time. Children outgrow tricycles and other toys, but most will never outgrow their delight in water. Whether your child is a toddler playing in the bathtub or a teenager riding a wave, you’ll want to be right there keeping them safe and sharing the fun.